Blood&ThunderFeb2011ZK005 a photo by Zeeev on Flickr. 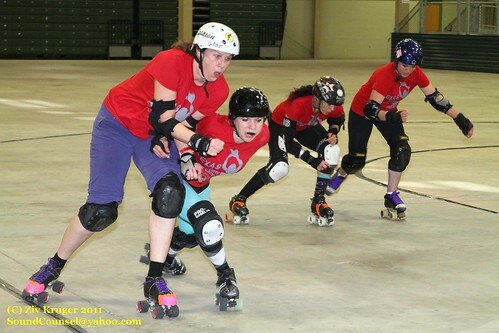 My current league, Crude City Roller Derby, hosted a Blood & Thunder Training Camp the last weekend of February. Tryouts for a Roller Derby World Cup team that will compete in December 2011 were held during the camp. This shot was taken during tryouts. After the hour and a half tryout, when we were offered the chance to verbally promote ourselves on video, all I could say was, "I wish you would have done this when I was 35."